California Vegetation Map Catalog (Information Center for the Environment) Includes records for vegetation map data sets that cover the entire state or specific parts of the state, with an emphasis on county-level or larger data sets. Search by keyword, county, ecoregion or hydrologic unit. Checklist of Online Vegetation and Plant Distribution Maps (UC Berkeley Earth Sciences and Map Library) Links to online vegetation maps. International Bibliography of Vegetation Maps, Vol 1. Vegetation Maps of North America (Kuchler) 1965 (Ref Qk 101 D83 vol. 1) The California section lists vegetation maps which have appeared in periodicals, books and government documents through 1965. CalFlora (CalFlora) Provides information on 8,375 currently recognized ferns, conifers and flowering plants in California, including over 800,000 records of plant observations and 20,000 photographs for half of the included species. Each entry includes common and scientific nomenclature, plant communities, habitats, elevation, notes on geographic distribution and lifeform, a map of geographic distribution by county based upon entries in the California Occurrence Library, and photographs if available. Search by common or scientific name, county, lifeform, elevation, plant community, and other parameters. California Rivers Assessment (CARA) (Information Center for the Environment and California Resources Agency) For each of the 120 river basins in California five maps are available: hydrologic, vegetation, shaded relief, land ownership, and a 1:24,000 quad grid. Other nongraphic watershed statistics and information are also available. IceMaps2 provides interactive mapping capability. 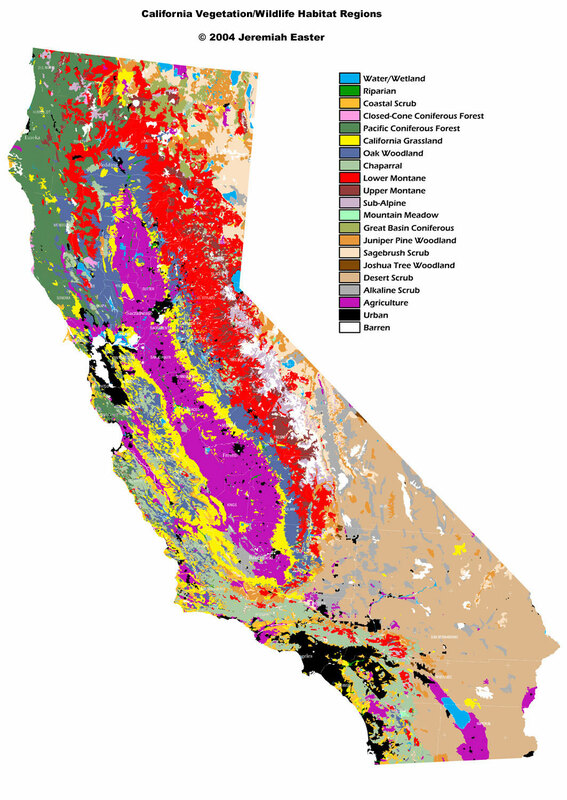 CalVeg (Classification and Assessment with Landsat of Visible Ecological Groupings) (US Forest Service) Mapping and classification system of California vegetation based on computer-assisted processing of satellite imagery that meets regional and national vegetation mapping standards. CALVEG: A Classification of California Vegetation 1981 (QK 911 C34 1981) Contains descriptions of the original 129 vegetation alliances. CALVEG: Mosaic of Existing Vegetation of California 1979 (map G 4361 D2 1979 U5) Map of existing vegetation at a scale of 1:1,000,000; includes accompanying descriptive booklet. CalVeg Geobook 2001 (QK 149 C375 2001) Self-contained electronic "book" on cd-rom that provides information on CalVeg vegetation alliances. 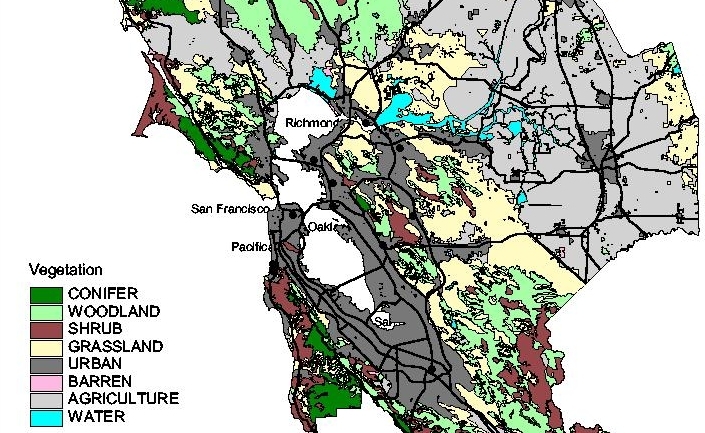 It is keyed to the National Hierarchical Framework of Ecological Units found in California. Each alliance includes a description, maps and photos. Existing Vegetation Data 2001 (QK 149 E85 2001) Set of GIS files for the state on cd-rom..
Central Valley Historic Mapping Project: Mapping 20th Century Vegetation Change (California State University, Chico Geographical Information Center) Set of historic natural vegetation maps for the Great Central Valley of California. Four period maps (pre-1900, 1945, 1960, and 1995) identify major changes that have occurred in the Great Central Valley due in part to hydrologic alterations associated with the Central Valley Project (1945) and the California State Water Project (1973). Jepson Online Interchange for California Floristics (UC Berkeley Jepson Herbarium) Comprises all online information regarding the vascular flora of California produced as part of the Jepson Flora Project. It serves as an ongoing update to the Jepson Manual. Search by scientific or common name using the Index to California Plant Names; generate a species list by bioregion, or search specimen data by various geographic parameters using the SMASCH database from the Consortium of California Herbaria. Species distribution is plotted on a bioregional map. Land Cover Change (California Department of Forestry and Fire Protection Fire and Resource Assessment Program) Series of county maps that map and assess changes in California's vegetation during a five year period. The five regional areas of the state are updated on a five year cycle. Part of the California Land Cover Mapping & Monitoring Program (LCMMP) that is a collaborative effort of the US Forest Service and CDF. Natural Vegetation of California (Kuchler) 1977 (map G 4361 D2 1977 K9) 1:1,000,000 scale map, with accompanying booklet, of the potential natural vegetation of California; depicts 54 plant communities. Prepared in conjunction with Terrestrial Vegetation of California (ref QK 149 T44 2007). Soil-Vegetation Maps (California Cooperative Soil Vegetation Survey) (map G 4361 J3 s62 U5) Ongoing map series at a scale of 1:31,680 or 1:24,000 that shows soil and vegetation characteristics in units as small as 10 acres. Geographic coverage is mostly northern California. See the index on Map Display Panel in the Atlas and Map Collection in the Library. Timber-Stand--Vegetation Cover Maps (California Cooperative Soil Vegetation Survey) (map G 4361 K2 s31 U5) Series of 467 maps produced between 1948 and 1962 at a scale of 1:31,680 which show timber characteristics in northern California. Vegetation Maps (University of California, Davis. California Rangelands Research and Information Center) Includes four maps: California Rangelands, Intermountain Rangelands, Mediterranean Rangelands, and Desert Rangelands. Vegetation Classification and Mapping Program (VegCAMP) (California Department of Fish and Game) Program develops and maintains a standardized vegetation classification system for California based on the National Vegetation Classification System and works with partner agencies and institutions to produce detailed vegetation maps. The Manual of California Vegetation serves as the basis of the classification. The site links to reports produced in the ongoing program, vegetation maps available through BIOS and available GIS data. A map is available of California Vegetation Mapping Projects Based on the National Vegetation Classification System. VegCAMP reports are also available in the CDFG Documents Library. Vegetation-Type Maps (US Forest Service) (map G 4361 D2 s62 U5) Series of 266 maps at a scale of 1:62,500 produced between 1928 and 1940 showing the vegetation of central and southern California. Twenty-three plant associations are identified in units of at least 20 acres in size. An accompanying booklet explains map symbols. The Wieslander Vegetation Type Mapping Project is an ongoing effort to digitize the products of the vegetation-type survey conducted by A.E. Wieslander during the 1920's and 1930's, most of which was never published. The dataset consisting of photos, species inventories, plot maps, and vegetation maps covering most of California at scales of 1:125,000 (30"), 1:62,500 (15"), 1:31,680 (7.5") or 1:24,000 (6"). It provides a snapshot of the state's vegetation in the early 20th century, making the collection an invaluable resource for examining changes in land cover and use, or habitat restoration. The site that is under development will provide georeferenced data and maps using a map browser interface and a database query by quad name, county, or species plot data.